The bottom of the mailbox should be forty (40) inches above the ground. 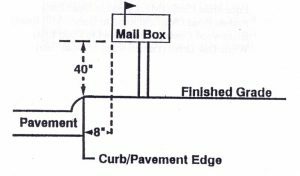 The front of the mailbox should be eight (8) inches in from the back of the curb or edge of the road or shoulder. Posts should be 4 x 4 inch wood posts or a two (2) inch thin-wall steel pipe. Not acceptable are mailboxes closer than eight (8) inches or protruding into the street. Not acceptable are posts larger than 4 x 4 such as railroad ties, mailboxes in brick piers, I-beams, etc. 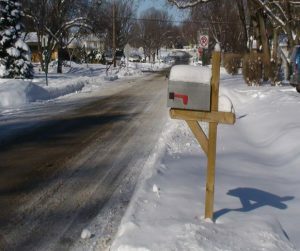 Snow removal for mailbox approaches is the responsibility of the homeowner when mailboxes are not installed according to the guidelines. 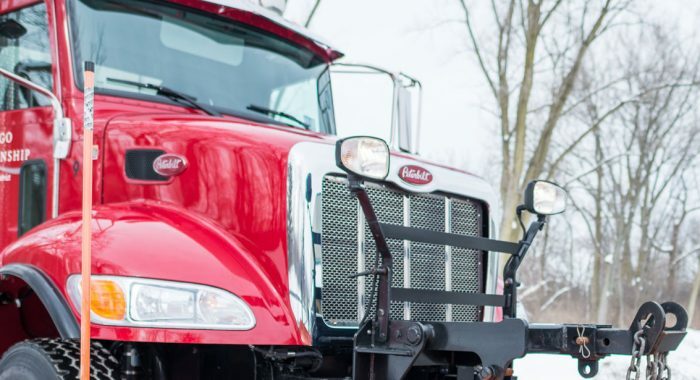 If installed properly and the mailbox and post is damaged by Township equipment when snow plowing, we will replace it with a “standard” 4 x 4 wood post and support. Mailbox replacement is the standard box, model 1C. If the post is damaged but can be repaired, it will be repaired. Not all mailbox damage is from the Township equipment. Old, rotten, rusted through posts, or vandalized boxes are not the Township’s responsibility. If the mailbox does not conform to the above guidelines, the Township will not be held responsible for any damage.